Glass Ceiling Index | Passing Through . . . . IF YOU are a working woman, you would do well to move to New Zealand—or if that is a little out of the way, you could try one of the Nordic countries. To mark International Women’s Day, The Economist has compiled its own “glass-ceiling index” to show where women have the best chance of equal treatment at work. 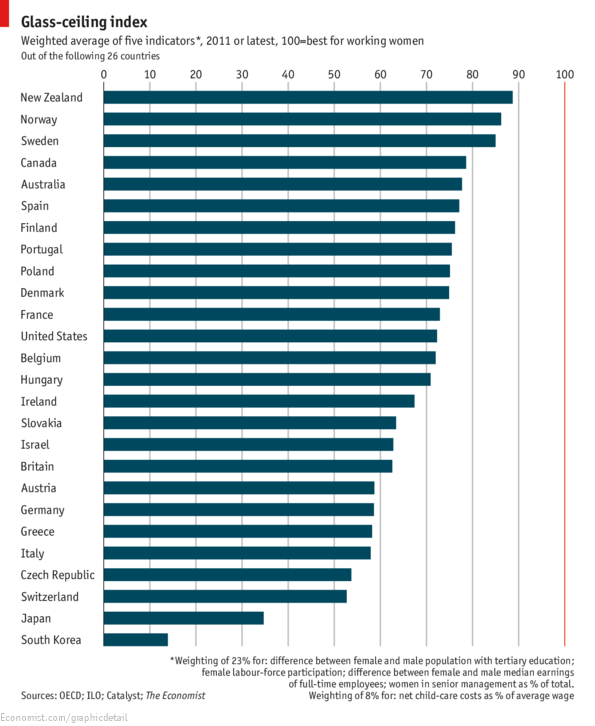 Based on data mainly from the OECD, it compares five indicators across 26 countries: the number of men and women respectively with tertiary education; female labour-force participation; the male-female wage gap; the proportion of women in senior jobs; and net child-care costs relative to the average wage. The first four are given equal weighting, the fifth a lower one, since not all working women have children. New Zealand scores high on all the indicators. Finland does best on education; Sweden has the highest female labour-force participation rate, at 78%; and Spain has the smallest wage gap, at 6%. The places not to be are South Korea and Japan, partly because so few women hold down senior jobs (though the new president of South Korea is a woman).